On a trip last month, Mesquite, NV gave us couple of avian delights. 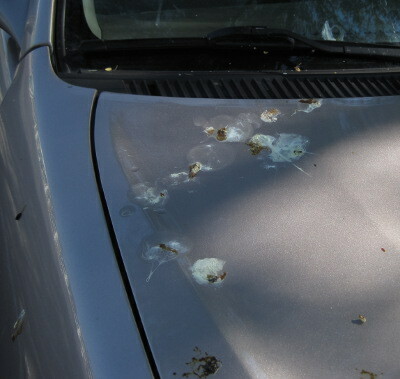 First the roadrunner, strutting around a side street poking its head into bushes, hunting as we watched from the car. 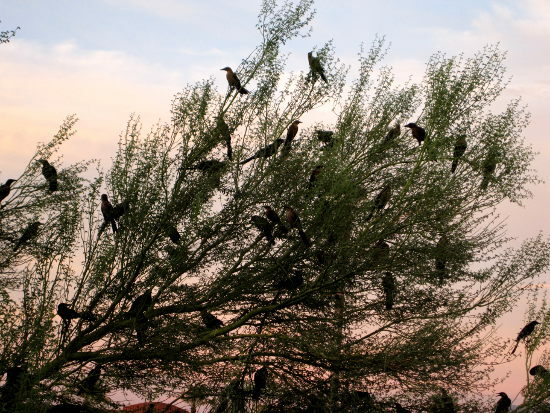 Then, in the evening, a convocation of grackles -- several hundred of them -- in the tree just across from the third-floor balcony at our casino hotel. All chattering with each other, making an amazing variety of noises as they flew from branch to branch, occasionally bickering or feeding each other or landing on a branch too weak to support them. Grackles make some amazing sounds. We don't have them at home, so I only hear them on trips, but they always want to make me look for the amplifier and speakers -- it seems impossible that a medium-sized bird could be making all that sound, and such a variety of noise, all by itself. We stood there for maybe 20 minutes, watching them and listening, shooting photos and video, before the heat (over 100 even after sunset) got to us and we had to go back into the room. Unfortunately, in all that time, one thing that never occurred to us was that our car was parked right under that tree. We realized that the next morning. And we had thought we were so clever, finding the one shady spot in that parking lot!